Revue Scientifique et Morale du Spiritisme, La. 1/1, July 1896-1926. 7 francs, 64 pp. This journal represented a growing division within the Kardecist spiritualists of France in the 1890s. 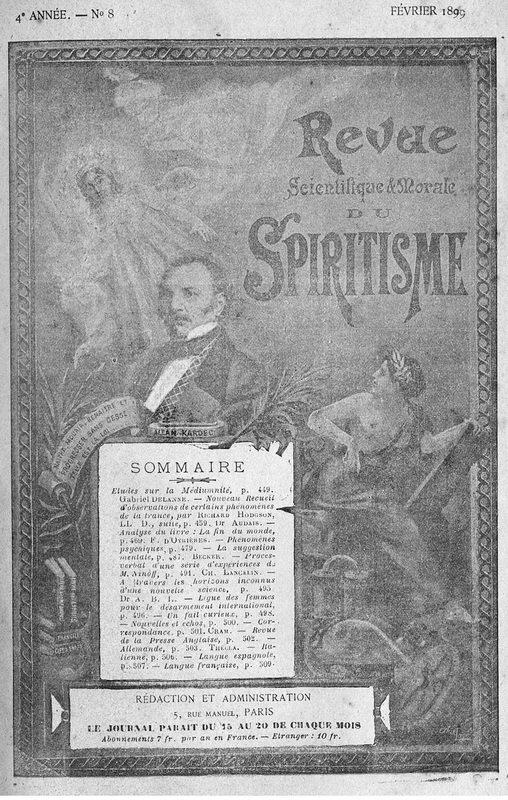 Delanne (1857-1926) was the president of l'Union Spirite Française and started the journal in an effort to bring spiritualism within the then-vibrant world of psychic phenomena and psychical research. The opposition favored the Progres Spirite, founded in 1895. Delanne was the apostle of spiritism in its second phase. He spoke at the eulogy at the death of Amelie Baudet, the widow of Allan Kardec. Articles by Leon Denis, Carmencita Noel, A. Jounet, Camille Flammarion, C. Lombroso, Ch. Le Clement de Saint-Marcq, et al. On Delanne's death, the journal was merged into the Revue Spirite. Dorbon 4098. Boston Public Library; Universitiy of Minnesota; Amsterdamse Universiteitsbibliotheek; ZDB: Freiburg Inst Grenzgeb Psychol; Dusseldorf UuLB; BL; BNF.